Beginning in July of 2001, Dr. Yuri Pichugin joined the CI team as Director of Research. At the end of December, 2007 Dr. Pichugin ended his employment with CI and returned to Russia/Ukraine, with plans to work as a contract researcher for CI and other organizations. 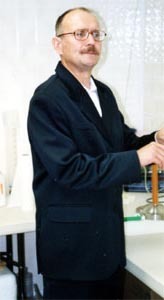 Born in the former USSR, Dr. Pichugin served since the 1970's as a researcher at the largest cryobiology center in the world, the Institute for Problems of Cryobiology and Cryomedicine, in what is now Ukraine. Between 1994 and 1998, Dr. Pichugin and colleagues did contract work for CI involving repetition and evaluation of our work with sheep heads, cracking limits with cat brains, and electrophysiological evaluation of frozen and thawed rabbit brain pieces. The rabbit brain work resulted -- for the first time ever -- in obtaining coordinated electrical activity in networks of neurons after rewarming from liquid nitrogen temperature, using glycerine as the cryoprotective agent. Dr. Pichugin has been employed in cryobiological research at a major California university for a corporate consortium, occupied mainly (according to public information sources) in work involving successfully improving the viability of rat hippocampal slices after various cryopreservation treatments including vitrification. Dr. Pichugin's academic qualifications, years of experience, published papers, and previous and current research contributions in the area of cryonics-relevant cryobiological research are in many respects unique worldwide. Since joining CI, Dr. Pichugin's work has produced demonstrated improvements in patient care, and has led to new cooling rates and improved washout and perfusion solutions for the organization. Dr. Pichugin has also been asked to consult on cryobiological matters relating to children's epilepsy at the Harvard Medical Center, and he is currently working on a new approach to vitrification that he and CI hope may radically advance the procedure, with life-saving implications not only for cryonics but also in the field of organ cryopreservation and organ transplants. "I was born on August 27, 1951, in Russia (the former USSR), in the city of Tomsk in Siberia. In 1976 I graduated from the Tomsk State University (Chemical Faculty, Department of Organic Chemistry), and then in 1978 I moved to Kharkov, in the Ukraine, in order to work in the Institute for Problems of Cryobiology and Cryomedicine of the Ukrainian Academy of Sciences. "In 1988 I defended my dissertation: "The Dependence of Cytotoxity and Cryoprotective Activity of Diols on their Structure and Physicochemical Properties. "Through 1994 and 1998 I had the opportunity to perform research on cryopreservation of brains and brain tissue of animals, thanks to the support from the Cryonics Institute and the Immortalist Society. "Beginning in January 1999, I worked at the Institute of Neural Cryobiology on projects involving cryopreservation of rat hippocampal slices, and also at the research institute of a major university in Southern California. "In July of 2001, I became Director of Research at the Cryonics Institute." Q: Have you always been interested in longevity and cryonics, Dr. Pichugin? Pichugin: Yes. I actively took part in immortalist and cryonics movements in the former Soviet Union directed towards overcoming human diseases, aging, and death. As early as 1975, I left the the Komsomol, rejecting communism's negative relationship to immortalism and cryonics. Q: Are you yourself a cryonics member? Pichugin: Yes. I am a member of the Cryonics Institute member. My wife and son are as well. Q: What will be the focus of your work at CI? How will it differ from your work in California? Pichugin: I performed the Hippocampal Slice Cryopreservation Project -- the HSCP -- which was designed by a leading cryobiologist and was financed by INC, the Institute of Neural Cryobiology. The purposes of the project focused on vitrification of rat hippocampal slices. Soon we were able to obtain 70-80% survival of the hippocampal slice cells according to K+/Na+ ratio assay, and beyond. It was a great achievement. There are messages about the project on the Cryonet. For CI, I will first carry out experiments to improve the existing cryonic suspension procedure using rat and rabbit hippocampal slices. Q: Will you be working at the CI facility, or at another property? Pichugin: I will not be working at the CI facility. CI will be renting laboratory space in one of the business buildings near the CI area. Q: Can you tell us something about your wife and son? Will they be working here? Pichugin: I like the United States very much because there are more possibilities to work on cryonics projects than there are in the Ukraine and Russia. My wife is a person with a different outlook than mine. She likes home, and so she prefers to live in the Ukraine. My son graduated from the Kharkov University and will continue his education as a post-graduate student fellow on Theoretical and Computational Chemistry at Arizona University in Tucson. Q: Anything else you care to add? Pichugin: Only that I am continuously focused on my work now and that I hope to make beneficial improvements in CI procedures as soon as possible.